Unlike most fast food chains, Chick-Fil-A is closed on Sundays for religious reasons – but one particular restaurant made a special exception to their schedule earlier this week. A Chick-Fil-A in Mobile, Alabama opened their doors on Sunday as a means of granting the birthday wish of a 14-year-old boy with cerebral palsy and autism. Elijah Sprague was born prematurely at 18 weeks old. His mother, Rene, worked in the NICU where Elijah was born. After 6 months of Elijah living at the hospital, Rene decided to adopt him despite doctors saying that it was unlikely for him to live longer than one year. Needless to say, Elijah has outlived the grim prognosis and grown up to be a sweet teenager. 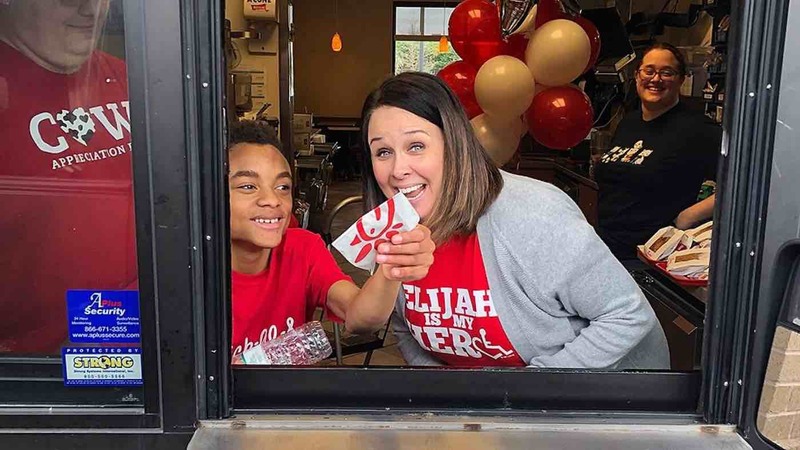 Today, the youngster adores Chick-Fil-A and dreams of one day working at a drive-thru window – so as a means of celebrating his birthday, his family asked the owner of the local sandwich restaurant if they could open their doors on a Sunday for Elijah’s special day. “He was like, ‘Why are you even asking? Absolutely, we have to do it,’” Sprague told CBS News. True to his word, the store opened on Sunday and staffers baked cookies for Elijah to give away at the drive-thru window. More than 40 family acquaintances stopped by the window, some of them even going through the drive-thru multiple times. Afterwards, the exuberant teenager and his friends were able to eat dessert and play in the restaurant.